Did you all know that today is Food52’s Shop’s 3rd birthday?? I love the shop at Food52. Everything is so thoughtfully curated and always so gorgeous. Sometimes it’s hard to tell if you’re buying a tabletop item or a piece of art! Food52’s Shop is actually where I pulled a large majority of my wedding registry items from! So fun! 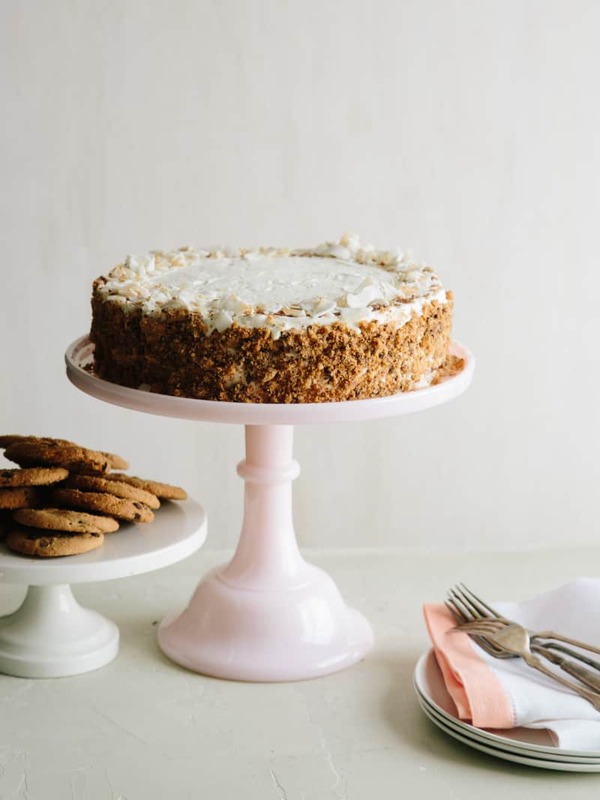 We’re celebrating Food52 Shop’s birthday with this Chocolate Chip Cookie Ice Box Cake! With the weather still blazing hot in LA and most of the U.S., this is the perfect NO BAKE cake to make! That’s right, just get a electric mixer ready (or your arm…whatever floats yer boat), some of your favorite store bought chocolate chip cookies a very short list of other ingredients and you’re ready to make this addicting ice box cake! 1. For the vanilla-mascarpone whipped cream: Place mascarpone, 2/3cup sugar and vanilla into a mixing bowl and beat together. Set aside. Pour cream and remaining sugar into another mixing bowl until stiff peaks just form. Fold the slightly sweetened whipped cream into the mascarpone mixture until just combined. 2. Spread a very thin layer of whipped cream onto the surface of a 9” springform pan and top with a layer of cookies, breaking up a couple pieces to fit into the larger gaps. 3. Top the cookies with another layer of whipped cream and repeat with cookies and more whipped cream until all the cookies have been used. 4. Refrigerate ice box cake for at least 12 hours, or overnight. 5. Remove from the refrigerator ,unmold from the springform pan and frost with remaining whipped cream. 6. 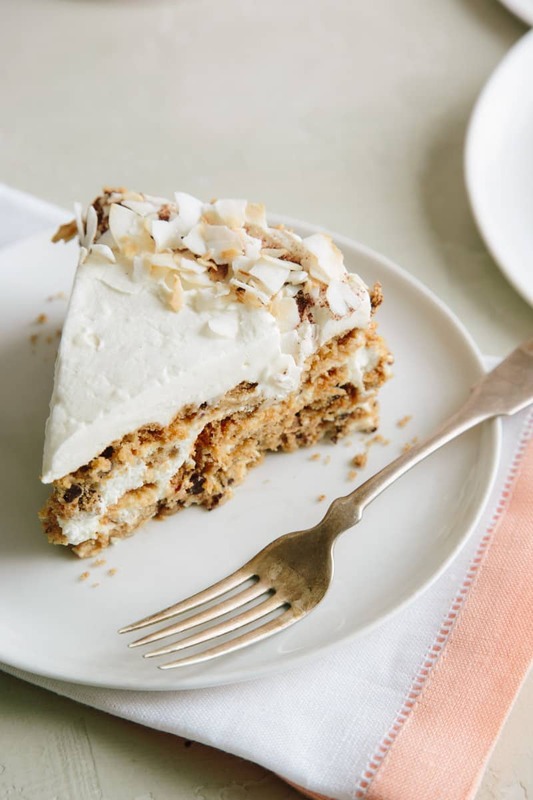 Surround the sides of the cake with the extra chocolate chip cookie crumbs (this is done the easiest when cake is cold and firm), top with shredded and toasted coconut flakes and serve. I love the Food52 shop too. I’m so excited about this no bake cake! I bet it would also be great adapted into a smaller version…maybe using some single serving ramekins. I wish I could have a whole Food52 kitchen. They have some great things for gifts as well. 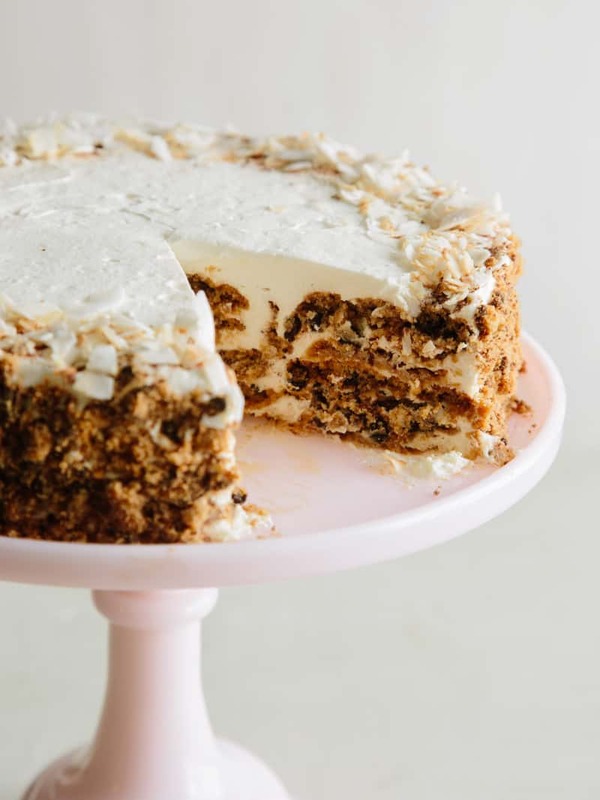 This icebox cake looks divine!